The Palace of Mad King Ludwig from Bezier Games is the sequel to Castles of Mad King Ludwig, which just happens to be my favorite game ever. In Palace, players are all working on building a palace together, instead of working on their own individual castles. The player who has contributed the most and has had the most influence over the palace wins. Palace will have different mechanics then its predecessor. One of the main things that the description points out is that there will be a visual endgame timer in the form of a moat that will slowly take shape around the palace. Once the moat connects, the palace is finished and one player will be the victor. I’m super interested to dig into the gameplay. 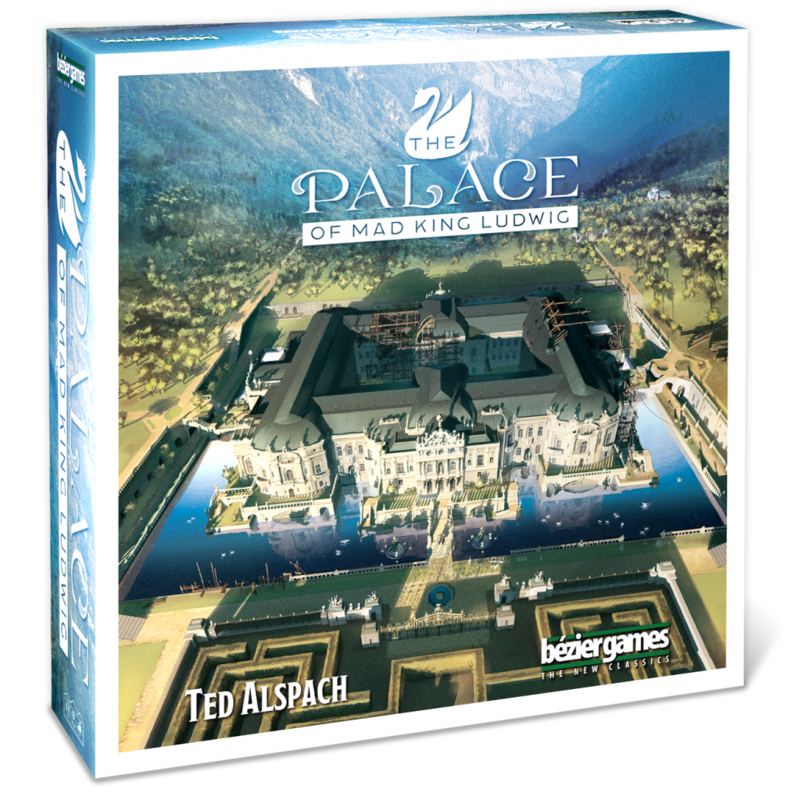 The Palace of Mad King Ludwig will still consist of tile-laying and creating a palace, but there won’t be any auction mechanic. Palace is for 2-4 players and takes about 75 minutes to play. It will only be available to demo at Origins, with a release date set for October. You can pre-order the game now for $59.95, and if you live in the U.S., you’ll get free shipping. 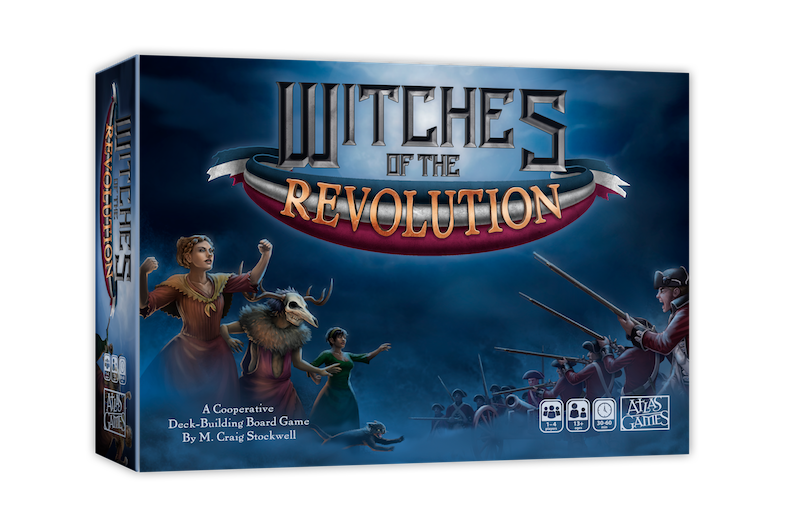 Witches of The Revolution from Atlas Games is a supernatural twist on the American Revolution with, you guessed it, witches! This co-operative deck-building game sets covens of witches against the tyranny of King George III. Each player has a deck that represents their coven. Atlas Games promises that there will be subtly different deck-building mechanics to help tailor your deck to specific threats. The witches must use their time and resources wisely to achieve their objectives, because as the moon wanes, their power weakens. Any time a deck has to be reshuffled, the moon track advances, weakening the covens. You’ll be able to collect powerful relics and use them to help you achieve four keystone objectives. Witches of the Revolution is for 1-4 players, takes 30-60 minutes to play and will be available to demo at Origins. There may even be a few copies for sale there. It will be officially released in July and will cost $39.95. Whistle Stop from Bezier Games is a pick-up and deliver tile placement game revolving around trains and railroads. Competition should be fierce as players lay down track tiles and block out other players. Players will build routes, pick-up and deliver cargo and create a network of “whistle stops.” As you play, you’ll gain shares in other railroads. You’ll need to balance the benefits of gaining stocks for delivering goods to small towns versus holding onto the goods to deliver them to the west coast for a bigger payout. I like the look of this game. The mechanics sound solid. In general it seems like it will be a good light to medium weight game. I’m definitely down to try this one out. 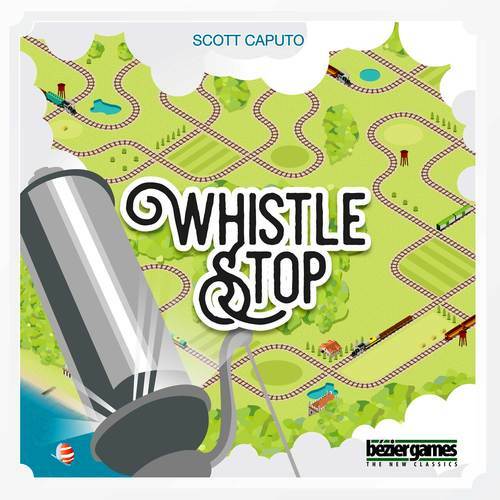 Whistle Stop is for 2-5 players, takes about 75 minutes to play and will be demoed at Origins. There’s no word on a price or release date yet. 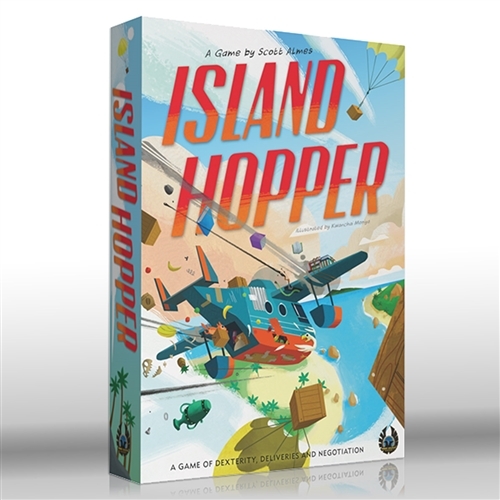 Island Hopper from Eagle-Gryphon Games is a light-hearted competitive game which combines auction and dexterity mechanics. The conceit of the game is that all of the players live and sell their wares among a chain of tropical islands. Because of your limited capital, you and your fellow merchants have pooled your resources to buy a seaplane to help you make deliveries. But here’s where it gets complicated… The plane won’t fit everyone’s goods, and it’s in pretty awful condition. Each day players auction off who gets to captain the plane. The captain cannot take their own goods, but they can take bribes. The other players will be bribing the pilot to get them to deliver their goods to certain islands. Once it’s time to fly, the pilot must close their eyes, pick up the goods tokens, and attempt to land them in an island’s harbor. If landed successfully, the pilot collects the bribe. An unsuccessful landing could mean all the goods might end up underwater. Island Hopper appears to be a quick, light game that sounds like a lot of fun. The theme is pretty adorable, and I love the sound of the blind piloting mechanic. It’s a bit pricey, so I’d definitely want to demo this one before I committed to buying it. Island Hopper is for 2-6 players, takes about an hour to play, and will cost $59.99. Eagle-Gryphon Games should be demoing this game, and it’s unclear if they will have copies to sell at Origins. Okay, let’s get this out of the way real quick. I can’t decide if I love or hate the theme of Purrlock Holmes: Furriarty’s Tail by IDW Games. I mean it’s kitty Sherlock Holmes. Ridiculous! But maybe also amazing? The game’s description is rife with puns, because of course it is. Again, I love/hate that! Anyway, the idea is that Furriarty is terrorizing London and it’s up to the players to help Purrrlock Holmes bust Furriarty’s gang. Each detective will draw a suspect card. That player will not be able to see their suspect, but all of the other player will be able to see the card. Using a “clock” mechanic, players will take turns guessing their suspect’s identity. The other players will then tell the player that guessed whether or not they’ve gotten a lead on their suspect. When you figure out enough leads, you bust the suspect and grab a clue that brings you closer to Furriarty himself. I definitely want to demo this one before I leap to buy it. Specifically, I’d want to see if there is substance to the game, or if it is trading on it’s ridiculously cute theme to attract buyers. 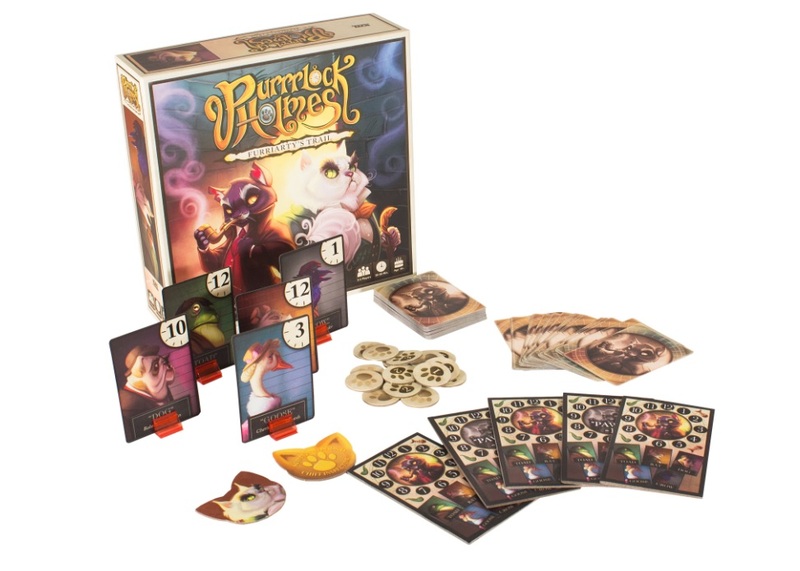 Purrrlock Homes: Furriarty’s Tail is for 2-5 players and takes about 20-30 minutes to play. No word on what the game will cost. Both Cottage Garden and Not Alone from Stronghold Games will both get their official U.S. release at Origins. Cottage Garden and Not Alone are excellent games that I’m excited to add to my board game collection. 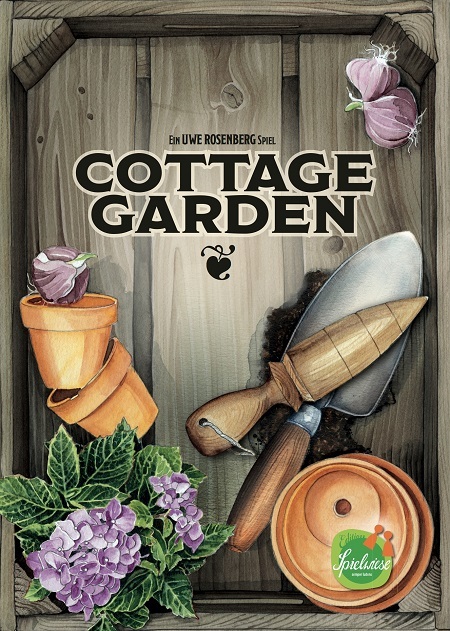 Cottage Garden is a 1-4 player tile-laying game where players are competing to have the best gardens. I’ve had the pleasure to play this game, and I really enjoyed it. I’m excited to get the opportunity to buy it! 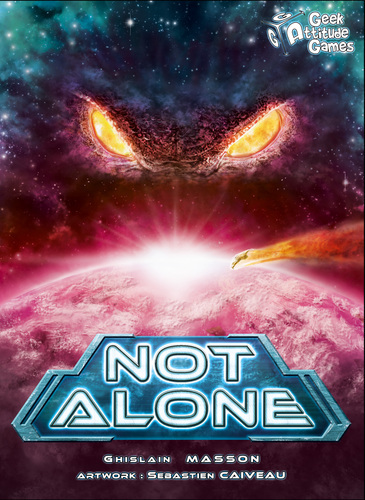 Not Alone is an asymmetrical card game for 2-7 players set on a mysterious planet. One player takes on the role of the “creature” while the rest are the human spaceship crew that are stranded on the strange planet. The creature is attempting to catch the crew members and assimilate them into the planet, while the humans are just trying to survive. For more information on both of these great games, you can check out my more detailed write-up. 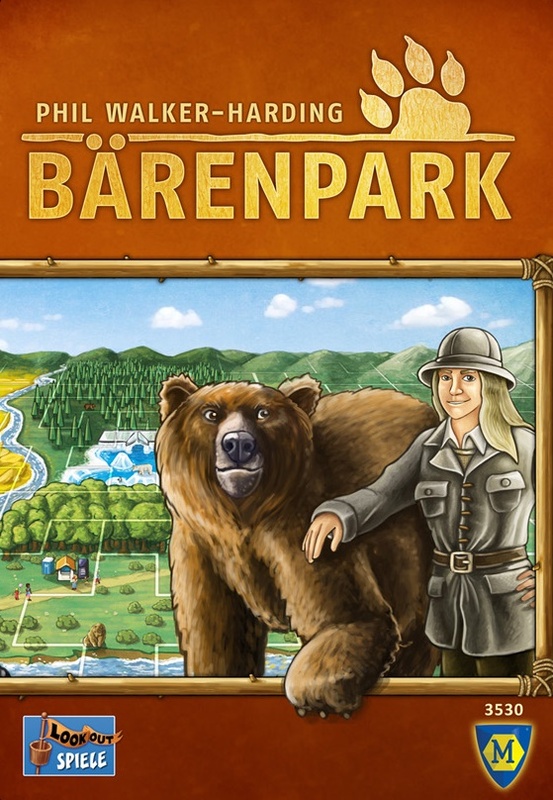 Bärenpark, published by Mayfair Games, is a competitive tile-laying game about building a bear park. Players must build their own bear park, choosing which bears to make enclosures for. They are attempting to use all available space efficiently and make the park beautiful for park visitors. Parks are built by combining polyomino tiles on a grid. Players will score points for things like animal houses, outdoor areas, completed construction and more. The game ends as soon as one player has finished expanding their whole park. Bärenpark definitely looks like a game I would enjoy. I definitely like tile-laying games, because I love trying to figure out how to best maximize my space on a grid. I’ll definitely be looking forward to a demo of this game. It takes 30-45 minutes to play Bärenpark, and it is for 2-4 players. Bärenpark’s official release date is June 30, 2017, but it will be available for purchase at Origins for $42.00.